In 1 Corinthians 11, Paul instructs women that they are to wear a head covering when “praying or prophesying”. The Greek word behind “woman” is “gynē” and it can be translated as “woman” or “wife” depending on the context. While almost all English versions of the Bible 1) Examples include the NIV, NASB, KJV, NKJV, HCSB and NET versions translate gynē as “woman” in verses 2-16, the popular ESV version 2) The RSV also advocates this view by translating 1 Cor 11:3 as ‘the head of a woman is her husband' differs by translating some of the references as “wife”. This has led many to wonder if head covering is only applicable for those that are married. Behind the ESV’s translation decision, is an assumption that a woman wearing a head covering was a 1st century Roman symbol of being a matron (respectable married woman). 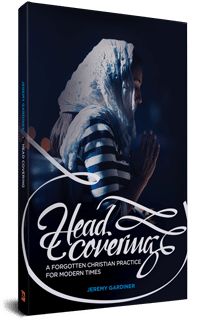 It is our objective in this article to prove that Paul’s teaching on head covering is for all men and women, regardless of their marital status. Creation order or Marriage order? For a man ought not to have his head covered, since he is the image and glory of God; but the woman is the glory of man. For man does not originate from woman, but woman from man; for indeed man was not created for the woman’s sake, but woman for the man’s sake. We see here that Paul is talking about the big picture–the differences between men and women as a whole. Once again, he doesn’t have a narrow focus of married individuals. If he did, and if we consistently translated gynē as wife here, we’d be left with Paul saying that wives originate from their husbands (1 Cor 11:8). This absurdity, although no one espouses it, forcefully makes the point that women (not just wives) are in view. Dr. Daniel Wallace (PhD, Dallas Theological Seminary) is one of the leading conservative Greek scholars. In a paper he wrote on head covering 3) See ‘What is the Head Covering in 1 Cor 11:2-16 and Does it Apply to Us Today?’ by Daniel Wallace on Bible.org. Dr. Wallace takes the ‘symbol replacement’ view. , he agrees that there is no contextual reason to translate gynē as wife. Here’s what he says: “We have not discussed at all whether single women or married women are in view in this text…Suffice it to say that [gynē] should be taken as woman (as opposed to ‘wife’) unless there are sufficient contextual reasons to argue otherwise.” 4) Daniel Wallace – What is the Head Covering in 1 Cor 11:2-16 and Does it Apply to Us Today?’ – Footnote #8. We must first point out that Grudem is looking in the wrong place for relevant evidence. He is looking to “wedding scenes” for support, but Paul is only concerned with how one worships. If one were to peer in on a 21st century North American “wedding scene” they would likely see the bride veiled as well. However, this snapshot would be inaccurate if it was used as evidence for how she worships, as she does not wear the veil after her wedding. 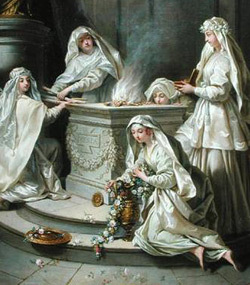 The flammeum, a distinct Roman marriage veil that was worn by the bride, was not worn after her wedding as well. 8) See ‘Kelly Olson – Dress and the Roman Woman’ (Routledge, 2008) Page 22 So wedding scenes are unhelpful for Paul’s discussion on worship attire. The problem with this evidence is that it’s only half of the story. The other side is told by these very same scholars, but is not told by Christian theologians advocating the “marriage veil” view. Here are four facts that will portray the other side of the story and help provide a more complete picture of this practice in 1st century Roman culture. 1. The literary evidence and archaeology evidence often contradict one another. 2. 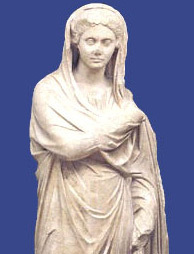 Roman women are seen bare-headed in portraits more often than with their heads covered. 3. There was not only one “Roman” costume. Roman dress would vary by province and different provinces had different customs on head covering. 4. Corinth was a multi-cultural city and Roman women would often wear their native costume, rather than Roman costume. 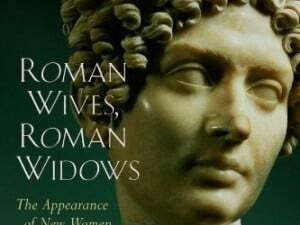 So while married Roman women may have often covered their heads in public (a fact we are not trying to cast doubt upon), this was far from being a unanimous practice. This type of partial observance is not what we would expect, if this was the cultural symbol of being married. These women, who took vows of virginity, covered their heads. Clearly then, the head covering was not a sign that they were married. Nobody in their culture would have interpreted it in that way. “So, too, did the Corinthians themselves understand him. In fact, at this day the Corinthians do veil their virgins. What the apostles taught, their disciples approve.” 22) Tertullian – On The Veiling Of Virgins – Chapter VIII. – Emphasis in the quotation is mine. Paul tells us that we practice head covering “because of the angels” (1 Cor 11:10) and because it conceals human glory (1 Cor 11:7). He does not say that head covering shows that one is married. Those that hold this view, usually arrive at this conclusion from cultural analysis (and as we’ve argued, an incomplete one) rather than biblical exegesis. Since there is no compelling historical or biblical reasons to see head covering as a sign of marriage, we affirm the practice for everyone, regardless of their marital status. ↑ See ‘What is the Head Covering in 1 Cor 11:2-16 and Does it Apply to Us Today?’ by Daniel Wallace on Bible.org. Dr. Wallace takes the ‘symbol replacement’ view. ↑ Daniel Wallace – What is the Head Covering in 1 Cor 11:2-16 and Does it Apply to Us Today?’ – Footnote #8. ↑ Tertullian – On The Veiling Of Virgins – Chapter VIII. – Emphasis in the quotation is mine. There is a blessing for those who submit willingly to God’s plan for visual protection! ~Liz, from her Abba Father! I believe there are spiritual benefits to being covered, but I don’t believe it has anything to do with the literal, physical cloth. If you cover with a humble submission to God, that allows a growth and strength in Him that makes the enemy aware. But if you cover, yet are either prideful, resenting, or otherwise, I think you could be a target for the enemy. Mormons believe in a physical protection from their “garments” and I would be wary of attaching a similar doctrine to covering. That being said, in a literal world, covering affects the way people view and treat you. I do think it protects in that manner. The angels (fallen or not) see us submitting to the created physical order, and timeless godly order, and projecting that belief in an outward manner. Similar to water baptism, yet perpetual in its testimony. This must have a literal (or physical) effect, that we probably won’t understand until we are in His presence. Just my opinion of course, according to my understanding. If I cover when I am prideful, it is my pride that must be removed, not my head covering. Two wrongs do not make a right. I live near Salt Lake City, UT – Mormon capital (boy it’s hard to find true Christians here). Their doctrine of wearing special undergarments is not practiced by everyone. They are mostly worn by “temple Mormons” or those who have gone through rigorous commitments and the temple sealing process (highly demonic and scary stuff). That being said, Mormons (or LDS as they prefer to be called) have ADDED TO SCRIPTURE with this doctrine of special garments. Head coverings are clearly found in the real Bible and is not added doctrine. The pride in covering specifically is what I referred to, and the presence of it is often noted by those who don’t practice covering. And I agree with you about the Mormons adding to scripture (Another gospel). Covering is a biblical doctrine. But there isn’t anything taught in Scripture (that I’m aware of) about covering providing physical or spiritual protection. I used to go to bed without a head covering, just to let my scalp breathe. But recently I started experimenting with wearing a covering to bed. After several weeks of going back and forth, I have found a 100% correlation between wearing a covering and sleeping very well, and NOT wearing a covering and having poor sleep, sinful dreams and nightmares. If only married women were to cover, then were only married men to remove coverings for prayer? I think not, tradition has had all men and boys remove hats for prayer. I believe the “symbol of authority” goes beyond just that of a husband, and includes her father (if single), male pastors she is under etc, and ultimately that she submits to the authority of God. And yes, I do believe it adds a degree of spiritual protection against the fallen angels and a power in prayer that is not there when a woman is not covered in prayer. Messiah is EVERY man’s head. Therefore ANY man, not just the married, praying or prophesying with covered head dishonors his head. Only one man can be a woman’s head. Only a married woman has a head and therefore is the only kind of woman that can dishonor her head when she prays or prophesies uncovered. The widow and divorced woman do not have a head and therefore would be symbolizing something that was not true if the were to wear a covering. The virgin daughter living at home has a covering in her father. He is her authority, but it is not to the same extent as with a wife. The authority of a husband over the wife extends well beyond the father over the daughter. The father has limited authority over the daughter (without going into detail) and thus the covering does not paint the the right picture. I am a full time, head-covering wife who has no children. So I really haven’t given much thought to coverings for girls or widows. However, I absolutely agree that my head covering does provide me spiritual protection, and power to my prayers. I feel like I’m going to battle without armor when I don’t have on a head covering. Yet I feel empowered when I do wear it. I have read this article before, and really like it. However, he makes some assertions that I don’t believe are true. He asserts that covering the head has no meaning in our day. If that were so, why would it be humiliating? In my opinion, what women find “humiliating” is precisely what the symbol clearly signifies. Submission. They may not even realize it until they begin to practice this. Wallace doesn’t have an answer to what other symbol would be appropriate either. He suggest wearing dresses and long hair which, ironically, bring about a similar reaction (for many) to the fabric covering. I actually kind of see Wallace’s point that women would feel humiliated wearing a head covering at church today, simply because it is such a foreign concept these days. But, as with really any tradition, it’s all about knowledge and perspective. Think about the tradition of feet washing. For anyone, that could be humiliating if done improperly. The proper response to these feelings shouldn’t be to change the Bible, it should be change oureslves. Yeah, reading that from him was pretty shocking. It felt like the rational that Jesus was correcting with the Pharisee in Matthew 15:4-6. Really love the work and ministry of Wallace though. Top notch scholar. This is akin to the Hebrew Roots Movement. You get some people who aren’t getting their emotional needs met in the Church today. THey see the Church in all it’s broken pieces. They want to be unbroken. They research what makes it unbroken, and come up with Jesus was Hebrew, we’ll pretend to be Hebrew. So those old hebrew rules apply. Now the head covering thing, may or may not KNOW they are of the HRM, but that is irrelevant, it’s the same principles, and mindset that causes it. Here is my question for all of those types. Jesus the Christ’s ministry is founded IN THE ORDER OF MELCHIZEDEK’S. Now That means, Christ’s church will be ran like Mel’s. Melchizedek was High Priest to God Most High, and King of Salem. Or King of Peace. Christ is our High Priest to God Most High, and the King of Kings, but He is known as the Prince of Peace. Respect to the one that came before…. Melchizedek was High Priest before a Jew existed, and before the Hebrews existed. Thus he was there before ANY of the written laws the HRM and head covering folks apply to their faith. So the irony is this, in their attempt to be closer to GOD, they literally look to Jesus Church, SPIT ON IT, and turn and walk away to it, and follow the Levitical/Aaronic Priesthood’s churches. It’s a sad sad thing. Hi @disqus_96hF53VynZ:disqus, I don’t believe a comparison to the HRM would be accurate. The command for head covering is not an Old Testament command, but a New Testament command. It was delivered in Greek to the Corinthian church AFTER Christ’s resurrection. We’re not restoring the old testament law, but seeking to restore a practice given to the New Testament church. The HRM comment was in relation to how people psychologically aren’t happy with what they see in the Church and want to do more to be HOLIER for God. There is nothing in scripture that says the head covering does ANYTHING for the woman. So any woman thinking it’s a holy thing to do, or who wants to please God and is looking for more ways to do so is on a pipe dream chasing this. Paul warned it was for the MAN’S benefit, not anything to do with the woman. Her Glory was in her hair, long flowing beautiful locks….etc…. Consider where the letter went to, the capital of Greece at more than one point, halfway between Sparta and Athens, key trade center, connected two seas together, one of the largest trade centers, the equivalent of a U.S. Los Angeles, Las Vegas, and NY, NY in it’s social status, I would think the high fashion coming through the area, the decadent ways of life in the region would be something you would want to cut back on associating with the Church. The normal lives the women grew up in, what they were taught to BECOME as a woman in the area, was counter to the needs of the church. Women were praised for their beauty. Paul said, Men get distracted by your beauty. Heppa brudder out. As I’ve never seen anything remotely suggesting women are doing this for the men in any group, it appears that women are being sold this is an act that will do something for them, or prove something of them, or something in there where they have a personal gain in some fashion. Scripture says it’s not about what you do but what HE does in you that makes you a more mature christian. It says through works of loving service, you grow to christian maturity, not through works of Self abasementment. Which goes along directly with Paul making this something left up to the woman to decide if it was appropriate. Now the lesson becomes, is she deciding it is appropriate because God called her, or because she wants to please men saying she should do it, or thinks there is a holiness benefit that isn’t suggested ANYWHERE in scripture. The motivation becomes the issue. Scripture says GOD changes you. The changes comes through works of service of love to others. This would be a work of self to help change self. That’s antithetical to God’s plan. So, what is your hopes, by encouraging an action that is misleading to most, and inconsequential at best? It breaks my heart when you say that we head-covering women are “on a pipe dream” and that our actions are inconsequential. Those words hurt me deeply. You probably haven’t read the beautiful testimonies of women who choose to cover. Nor have you heard mine. Please take the time, if you haven’t already, to read the many wonderful articles and testimonies on this sorely-needed website. You see, one of the reasons I cover is “because of the angels”. It has been my experience that when I cover, I am protected from almost all demonic attack. Especially when I am sleeping. If I cover while I sleep, I have pleasant dreams and sleep well. If the covering falls off or I am too lazy to put it on again before bed: I have nightmares, I sleep quite poorly, and I have tremendous temptations in my dreams that I wake up with and mull over. I believe this is because, when I cover, I am receiving extra protection from my angel(s) who see me in proper order of submission. This might not be the case for all covering women, but it is a huge thing for me. We really are spiritual beings, temporarily living in a physical, time-bound world. My objection lies in your key assertion in bold above that “Paul is stating the order of creation, not the order of marriage roles.” I believe that this passage is NOT talking about the order of creation NOR (primarily) about the order of marriage, but rather about God’s established authority structure, which flows from His nature. Marriage is (I believe) God’s ultimate object lesson in understanding the “multiple who are one” nature of the Trinity. Creation order supports this portion of this authority structure, and Paul uses that support later in the passage (v8-9), but creation order does not completely describe the authority structure. If it did, and if I am to interpret verse 3 as you suggest, it seems to me that I would have to acknowledge Christ as being created by God–obviously not the case. Rather than looking to 8 and 9 to help understand the topic of verse 3, I would suggest looking at how Paul concludes the theological portion of his argument in verse 10, where his “therefore” summation highlights authority, not creation order. I believe the use of the word “head” further supports verse 3 as being concerned primarily with authority rather than creation order. While I know that there are some that claim that “head” is being used to describe “source,” I do not believe (nor do I believe a majority of Greek scholars and all Bible translations I know of) that is in fact the case. More clearly, and by obvious analogy with the human body, “head” represents authority. Furthermore, if it was meant to refer to source, we’d have to acknowledge God the Father as being the “source” of Christ, which again is not Biblical. If head coverings are indeed about authority, then it seems to be that they could only rightly be applied to wives. Certainly there would be nothing wrong with unmarried women wearing them, and as you say it might be used to indicate that they understood and assented to God’s order in marriage. On the other hand, if this ordinance is explicitly to reinforce the authority of marriage (which certainly warrants a lasting ordinance) then headcoverings on unmarried women might draw away from that understanding. Furthermore, it could lead to an interpretation that women in general are to be under the authority of men in general, and THAT is not the message of this passage nor of the Bible as a whole. I see a little of this broadening of the symbol. in your extension of “headship” for an older widow to being their church elders. True, God has established the elders of the church in authority over the church, but that is not true of women alone, but men also. I confess that the application of head-coverings to unmarried daughters is appealing, as there is a single man to whom they are under authority, and it would align nicely with the principles from Numbers 30. However, again that authority relationship is not limited to female children, nor is it so clear from scripture how far (in age) that authority extends. Also, not all unmarried women even have fathers to be under the authority of, while by definition every married woman has a husband to be under the authority of. Finally, I agree that “wife” should not be substituted for “woman” throughout the passage. Despite my normal guideline that a word should be interpreted to mean the same thing throughout the passage, that is not a binding rule. Consider the obvious two-meaning use of “head” in this passage as a handy example of this. In conclusion, I believe that the head covering (presence of for a woman or absence of for a man) is not a symbol of marriage, nor of creation order, but of authority. Every man is under the authority of Christ, therefore none should be covered in worship. Every married woman is under the authority of her husband, therefore all married women should be covered in worship. I appreciated your thought-out answer. I am cautious about the idea of headship or covering for single adult daughters. I agree with you that support for this is much less clear biblically than for the roles delineated in scripture for husband and wife. In this area where there is so much danger of legalism, I prefer to live with that ambiguity. Thank you Jonathan and Jeremy for this peaceful and pleasant back-and-forth discussion. Your tones were both very polite and I appreciate that. (Lord, please keep me from teaching these men). I am a full time, head covering wife with no children. I am not sure whether unmarried women or girls should cover because I don’t apply to either situation. I respect both sides of the argument. But I do think that Jeremy is quite a busy person (wife, kids, job, book writing, blogging, e-mailing etc etc) and probably shouldn’t be expected to reply to every comment. Especially those that go on for quite a while. This last comment was quite lengthy and hard to follow but had some good points. I think this was a great time to “agree to disagree”, remember that Christ is the head, and move on. Thanks again guys. The practice of commanding men, but not women to remove their hats during certain occasions is because women’s hats traditionally required pins to keep them in place, so they were more cumbersome to remove than men’s hats. Women wearing androgynous hats, like baseball caps, are expected to remove them during the national anthem. When it comes to men removing their hats in church and women taking it off, theologians and cultural historians connect this to the biblical passage in 1 Corinthians 11:2-16. Notice she didn’t connect the practice to convenience but to the “biblical law”. Many more examples could be provided. But even if your point was granted, as Christians we still have a biblical command that is reference to how we are to worship God (praying and prophesying). So we don’t take our cues from the culture, but from the Bible (1 Corinthians 11:2-16). I was referring to the male/female hat distinction within secular environments. Though that raises some questions regarding men: can a man in freezing weather keep his head warm in an outdoor worship service? A very, very unlikely occurrence indeed. A man in that situation should either temporarily remove his hat during prayer or come to the conclusion that he is not covering for submissive but for bodily reasons. I am a full-time head covering wife. However, my husband does rarely wear sun hats in scorching heat, and I do remove my head covering when I shower. But the vast majority of the time, I am covered (especially during prayer, worship, prophecy and Bible study) and my husband is uncovered. What about soldiers, firemen, farmers, police officers, surgeons? Should they not pray because they cannot remove there helmets/hats? Thankfully I am not a male that has to make decisions like these. And I would never teach a man and tell him to do/not do something Biblical. There are always exceptions (should I keep my head somehow covered if I sing worship songs in the shower?). But men in these situations may pray before and after they cover their head, or temporarily remove them if possible. Some men and women are convinced that these verses (1 Cor 11:2-16) only apply during corporate worship. Although the Holy Spirit has shown me that this is not the case for myself, I still highly respect those who only cover/uncover during corporate worship. Two points…or at least main points. Being that you quote Jerome…’He says that these women do not “go about with heads uncovered in defiance of the apostle’s command…”,’ how can you hold to the covering only for the assembly? What does “go about” mean? Also, you only deal with the Roman culture when there is another culture that should be considered…the Hebrew culture of which Paul was a part and that was present in every Roman city and in each Messianic assembly in those cities. 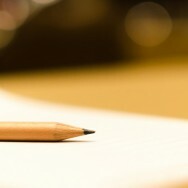 The display of scriptural authority and order is not just for the assembly. Our world needs to see it. The principalities and powers in the spiritual realm and the earthly realm need to see it. It is a testimony that causes reflection in those with soft hearts in the world and agitation (due the reminder that they are rebelling to authority) to those who are calloused. Virtually every other time in the NT that the “gyne” is used, it is in reference to a married woman. Virgins are called by a different word, widows are called by a different word. I know that “gyne” is generic and that Paul could have used it this way. The problem is that THE singular woman is under authority to THE singular man that Paul is addressing. Yes, only Eve was “out of man,” but much the same, only one woman is for each man. And those very same women are only to obey/be under the authority of their husbands and not any other man. Not all women are are under the authority of all men. True as it is that unmarried women are to be under authority, it is not husbandly authority that they are under. That said, they should wear a covering if their Father wants them to. The traditions/ordinances that Paul relates are not something just 20-25 years old, but like every other thing that he discusses in 1 Corinthians, are backed by the ancient scripture and the Biblical Hebrew (not necessarily Jewish) culture. Even the idea that it is a shame for a man to have long hair or cover his head is based on OT scripture and Hebrew culture and its application. We often do not understand these things because we focus so much on the NT that we do not have the OT foundation of what is being taught by the apostles. (A case in point is: Hebrews 12:15. There are all kinds of sermons and teachings on unforgiveness/bitterness that have used this passage, but the author was actually speaking of something quite different. See Deuteronomy 29:18 and following. Peter also refers to it in Acts 8:3) But I digress. Thanks for the reply. Here’s some comments back. 1) Regarding Jerome: when we quote a person we’re not saying everything they said is correct. We’re simply highlighting what he said about the topic under discussion. 2) When Paul uses paradosis (tradition) to refer to apostolic teaching he says it came “from us”. So how do we know if head covering is the tradition of men or of the apostles? Paul doesn’t leave us guessing. In 1 Cor 11:2 he said, “I delivered [the traditions] to you”. This means that head covering is authoritative apostolic teaching. 3) Paul agreed to not put Jewish customs on gentiles in Acts 15. This eliminates the possibility of him mandating a Jewish tradition. 4) While there are different words for different groups of women, I believe Paul uses the generic term because he’s not referring to any class of woman. He’s referring to women as women, not women as wives, widows, or girls. Thanks for sharing your thoughts and for representing this symbol. I appreciate your tone and how you shared your objections. being a light to. I think that we are to be lights to the world, not just each other. Head covering is not a Jewish custom. It is a long standing custom that is testified to in virtually every ancient culture. It is apparent in the scripture before Judaism is invented. There is a big difference between Jewish customs and Biblical/Hebrew customs. Baptism is a custom that developed in Hebrew culture that is also brought into Messianic belief. I agree with you that Paul and the other apostles did not put Jewish customs upon the gentiles. We just need to dig a little deeper into scripture to find that there were customs that came from before rabinical Judiasm or even the time of Moses into both Judaism and Christianity. I know that you do not believe everything that Jerome wrote (neither do I), but at such an early date, we see that head covering was more in keeping with the ancient customs of full time covering. 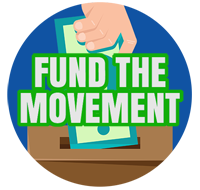 The idea of just in the assembly is a very new idea. I am not aware of any ancient discussion that would propose an only in the assembly covering. The early writers did discuss whether or not virgins should cover, but not whether it was only for assemblies. Is there anywhere in the first 5800 years of history where we see head covering only in the assembly? Have you looked in the NT Greek to find where “Gyne” is used generically? I think that the definite article for THE man and THE woman have a specific meaning. If Paul wanted to be generic, he could have simply left the definite article out. I stand by the idea that only THE husband/man is head over THE wife/woman and that the covering shows this authority and subjection relationship. It is symbolic of Messiah and the Church. It is not symbolic of Messiah and those that are not part of His bride. Concerning widows…they stand before YHWH without the covering of a man. Their vows cannot be annulled. The covering is a symbol of being under the protection of a man. When the law of jealousy is performed, the wife has her covering removed and stands before YHWH uncovered. It is as if she is a widow. Judgement falls upon her directly. Even in the case of Ananias and Sapphira, she is a widow when judgment falls directly upon her. The covering is a symbol of being covered. The covering of a husband over his wife is for life. He does not only cover her during an assembly. The symbol should reflect this full time covering. When the husband dies, the covering can be removed. The covering is authoritative apostolic teaching. I wholeheartedly agree, but the teaching was symbolic of something just like baptism is symbolic and the Passover meal is symbolic of something. The man is always supposed to be the covering. The woman is always supposed to let him rule over her. We fully submerge in water because we are buried in baptism…not just dusted in baptism. We partake of unleavened bread because Messiah is without sin. The symbol is supposed to be a close parallel. Women are to keep silence in the assembly because it paints the wrong picture for the bride of Messiah to stand and teach Him. He washes us with His word and not the other way around. I am sure you get my point. Please think about it a little more. Thank you for being willing to take a stand on this and for your gentle approach. I actually have been compared to a heat seeking missile. A little more John the baptist style than you. Hi Bo, thanks for sharing your thoughts. I understand where you’re coming from but respectfully disagree. The only point I wanted to correct is to point out that “woman” does not have the definite article 1 Cor 11:3. Only man does. 1 Cor 11:3 is a construction called Definite Predicate Nominative. In this construction one of the nouns will be the subject whereas the other will be predicate nominative. To determine which is the subject, there are identifying factors. One of those is the subject having the article while the other noun does not. This is not the only determining factor, but it is one. So in 1 Cor 11:3 man is given the article, not woman to show that man is the subject of the sentence whereas woman is the predicate nominative. Meaning if the subject wasn’t identified the passage could be translated the opposite way (woman is the head of man). Thanks for the Greek lesson! It is always good to know where one’s arguments are wrong or weak 🙂 As concerning married women verses all women, we are still having the same argument that the early writers had. But coming from a Hebrew perspective instead of a Greek one and knowing that the word “gyne” is always used in reference to married women, I have to be on the married only side. Also the teaching of the divorced and widow not being covered by a man in the OT sheds light on why the symbol would be wrong if they wore a covering…not one covering them, no covering. If you could answer a few questions directly, I would appreciate it. Is there any indication from ancient history of the head covering being only in the assembly? Or are the only indications that it was full time until about 150 years ago? Were you aware of the precedent concerning doing Passover incorrectly causing sickness from Hezekiah’s time? Were you aware that the root of bitterness is a reference to Deuteronomy? Just curious to know how much of the OT you take into consideration when studying the NT and how much bearing you think it has on discerning the truth. The first part does not say anything about coming together. It is over and over in the second part. Could this be an indication of Paul switching gears from full time practice to in the assembly practice? Paul only says that if a woman prays or prophesies uncovered it dishonors her head and if a man does so covered, he dishonors his head. Certainly there is praying and prophesying both in and out of the assembly. Hi Bo, here are a couple New Testament references where gyne refers to unmarried women. Luke 7:37 (prostitute), John 4:17 (Samaritan woman living with a man who’s not her husband), 1 Corinthians 7:34 (applied to both a betrothed and a unmarried woman), 1 Timothy 2:11 (women are to learn quietly). That’s a sampling and there a bunch of other verses where the marital status of a woman is not mentioned so it’s possible it could be either. I can point to many references in early church history where head covering is said to be for the local assembly. However, they don’t clarify if it’s *only* for the local assembly so it doesn’t further my argument. For example Clement of Alexandria said, “Woman and man are to go to church decently attired…For this is the wish of the Word, since it is becoming for her to pray veiled.” From quotes like that all I can prove is they believed it should be done in the assembly, but I can’t say that means they believed it was only for the assembly. There’s just not enough in-depth early writings available on this specific point. But to affirm your point, there were plently of church leaders who believed headcovering was a symbol of modesty and that it should be worn all the time. In Luke 7:37 the gyne is not called a prostitute but a sinner. We do not know if she was married or not. (Gomer was a married prostitute.) The woman in question could have been married or not…so the reference is inconclusive. In John 4:17 the gyne was living with a man not her husband. Does this mean that she did indeed have a husband? According to scripture she still is the wife of her first husband, or at least her last living husband, even though she has been put away. I Corinthians 7:34 is a very revealing passage. It says that there is difference between a gyne and a virgin. What is the difference? The gyne cares for the needs of her husband while the virgin does not have a husband to care for his needs. Therefore the gyne is a married woman. Also, a betrothed woman is considered a married woman in scripture, but this does not apply in this instance since Paul makes a definite distinction between the virgins and the married that he is speaking of. In 1 Timothy 2:11 the woman that should learn in all subjection and not exercise authority over THE man (I think her husband) will be saved in childbearing in verse 15. I think that she is married or else it was alright for the unmarried to get pregnant and have babies. We both do not think that this is a right thing. Please do not take this as mocking or as being disrespectful. It is just short and to the point. I do appreciate your effort to restore truth in these last days. Am I missing something in the passages? If the questions I asked on other matters are not something that you want to answer on this forum, is there a better way or place for us to discuss them? I am sure that we both have things that we need to be faithful in besides this, so do not feel obligated. But I would enjoy a good discussion as time permits. Hi Bo, I’d like to focus on the one example from that list that I think is the strongest and that’s 1 Cor 7:34 (especially since it’s Paul who wrote it and in the same letter as the instruction on head covering). Here we see that gyne used to refer to a wife in verse 33. Then in verse 34 that same word is applied to both a unmarried and a betrothed woman. Even though there’s different words that can be used to refer to them specifically, they are still all correctly called gyne (woman). We do the same in English, we use different words to distinguish between women (widow or wife for example) but it is still correct to refer to them generically as a “woman”. Thanks for the back-and-forth dialogue. We could obviously keep going but I’m going to leave it there. Thanks for the time you have spent, but I hope you at least read this answer to your answer. Please answer one more time. And if you have another answer, I would gladly read and ponder it. In pondering your answer and searching the scripture I noticed…”Houston we have a problem”…our translations differ. Which one better reflects the Greek? Mine says: 33 But he that is married careth for the things that are of the world, how he may please his wife. There is a big “difference” between “…and his interests are divided.” and “There is difference also between…” and it “interests” me which is right or at least better. Does “μεμερισται” relate a difference between the two types of women or that the Man has divided interests? Certainly, the word “interests” is not in any Greek text of this passage. Can the Greek be correctly translated with this much difference? Is there this much latitude? Is one translation a word for word and the other pushing things out of place? The Young’s Literal translation agrees with the KJV. The newer translations tend toward the ESV. Are Wescott and Hort heros to the conservative or their enemies? If you could enlighten me on the Greek, It would be appreciated. 33 But he that is married (gameo) careth for the things that are of the world, how he may please his wife (gyne). 1. He says (vs. 34) for sure that a virgin (partheos) is not a “gyne.” They are not the same. There is a difference between a “gyne” and a “parthenos,” whatever a “gyne” is and what ever a “parthenos” is. means virgin. This and the added word “interests” causes me to distrust your translation. 4. The word “agamos” (unmarried) also does not have the word “gyne” alongside it. I think that it is because they are opposites. It also does not have “parthenos” alongside because it would be redundant. 6. So “gyne” is not applied to both the married and the unmarried, but only to the married. I think that you have written, correct me if I am wrong, that it is better to err on the conservative or careful side of an issue and also to use the more clear passages to interpret the less clear. To this I say, Wescot’s and Hort’s version of “what the scripture ought to say” is not the most conservative way of taking this passage. It is not being careful. I also say that of all the 200 verses that use the word “gyne,” 99% or more use the the word to mean wife or are inconclusive. The more careful way is to use the conclusive passages. In 1 Corinthians 11 the words are inconclusive or, as I think, tend toward wife and not simply woman. 1 Corinthians 7 is either very direct in saying that a “parthenos” virgin is not a “gyne” or it has so many versions in the Greek and thus the translations that it is inconclusive. If the former, my view is sustained. If the latter, your view is still not proven and mine not dis-proven via this passage. 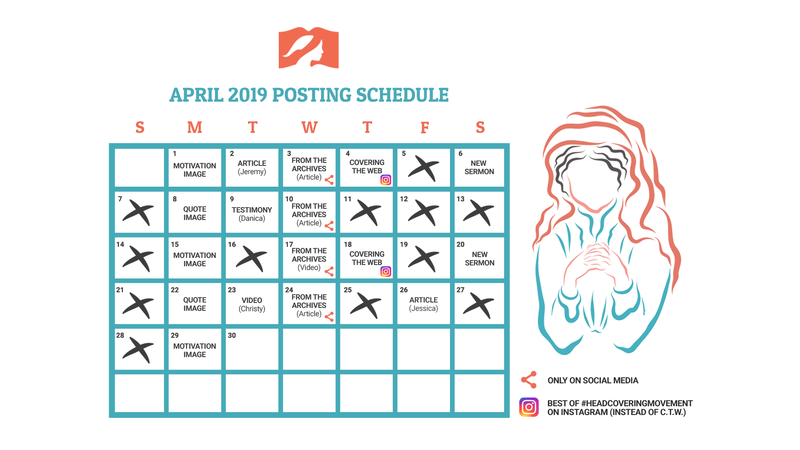 To this I add that the early church writings show no support for an assembly only head covering, but where discernible, would show full time head covering. Only in the very recent has the idea of only in the assembly head coverings come into play. This is probably caused by current western culture of the past 200 years and is not in keeping with the traditions of the apostles and the Biblical culture. So I still stand with the head covered wife being the symbol to the world and to the angels (both good and evil) and to the chruch of the authority and headship priciples of YHWH. To mandate veiled virgins and widows or to only cover in assemblies does not show the correct symbol. For only the married have heads and their husbands are their heads 24/7, not just in church. This is a picture of Messiah and His bride. He is our head 24/7. passage. I do not know how to get this to post in the right place. Aside from Jerome’s comment which Bo mentioned, do I understand you to take a general silence argument (that you have not found specific teaching clarifying that veiling is also for outside the assembly) as support for your understand that veiling was only/primarily for when they were gathered in the assembly? Thanks. To add to what I said to Bo in response to you, I don’t appeal to history on the when/where. It’s derived from the context/structure of 1 Cor 11-14 not a general consensus of church history. Gotcha. I skimmed it too fast, apparently. However, why accept Clement’s statement that the veiling was for the gathered assembly, but dismiss Jerome’s supporting/expanding statement that the intent was beyond just the gathered assembly? From what all I’ve seen of your writing this far, surely this isn’t just a dismissal simply because Jerome’s comment doesn’t fit with your view as well as Clement’s does…? Not quite sure I understand. My argument is not that there was a unanimous view or that we should go with what the early church believed. Some clearly believed that it was for outside the assembly, but others only mention the church. I’m not saying we should go with Clement. I just put him forth as an example of a passing statement where we cannot understand his view fully on the “where”. I was understanding your comment against Jerome’s statement as a rejecting of the “outside of church” idea, but still accepting the more minimal “in church” statement of Clement. I apparently misunderstood. I do apologize. I know this post is 2 1/2 years old, but I was wondering if this same argument applies to divorced women as well.